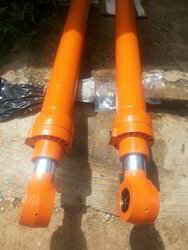 We are known as the manufacturer and supplier of Hydraulic Cylinders for all types of excavators. Our products are of world class quality and highly demanded for their effective professionals. The offered products are highly durable in nature. Our Hydraulic Cylinders is anything but difficult to utilize and savvy when all is said in done. This is a unique sort of result of this item class. The working depends on pneumatic chamber. We are assembling water driven chambers which is uneven as far as working. In the production we are fusing universal standard quality parameters. Bharani is the trusted name among our customers for offering a wide array of precisely engineered Komatsu Excavator Cylinders. Manufactured in adherence to the preset industry standards, these cylinders are quite popular in the industry. Made available in various specifications, the offered cylinders are robust in construction, durable, and offer smooth functioning. We are one of the preferred choices of our customers for offering high functionality Hydraulic Cylinders. Manufactured in compliance with the preset industry standards, these hydraulic cylinders are reliable in their performance and offer high durability and operational fluency. The entire range is tested for its quality and flawlessness before the final delivery. Bharani is the trusted name of the industry that provides an extensive range of Volvo Hydraulic Cylinders. Manufactured in several specifications, these superior functionality cylinders are precisely engineered under the strict supervision of our experienced professionals. These cylinders are widely acknowledged for their robustness, operational fluency, lightweight and cost effectiveness.